1. NKR Defense Army was officially established on May 9, 1992 to defend Nagorno Karabakh's population against Azerbaijani military aggression; it remains true to its mission. 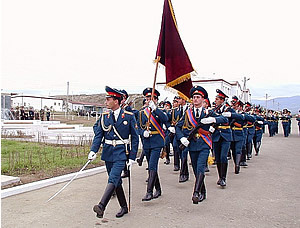 NKR Army united self-defense units of Nagorno Karabakh that were formed in early 1990s to protect the NK population against Soviet and Azeri attacks. 2. NKR Defense Army was among the first organizations that confronted and successfully fought against international Islamic terrorism. When Azerbaijan failed to gain control over Nagorno Karabakh, its leaders hired Islamic radicals to fight against the Nagorno Karabakh Armenians whom they presented as "Christian infidels." Azerbaijan's government-recruited mercenaries included Afghan mujahedins, Chechen fighters and other Islamic radicals. 3. NKR Defense Army's successful military operations in 1993-1994 forced Azerbaijan to recognize Nagorno Karabakh's ability to defend itself. 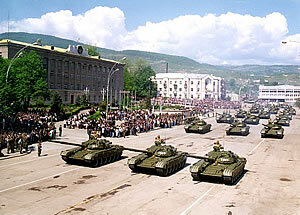 This recognition lead to a cease-fire accord signed by Azerbaijan, Nagorno Karabakh and Armenia on May 12, 1994. 4. As a critical component of the established balance of forces, NKR Defense Army contributes to regional stability in the Southern Caucasus. 5. NKR Defense Army is the main guarantor of security of the people of Nagorno Karabakh. 6. NKR Defense Army stays out of politics and is under strict civilian command of the democratically elected government of the Nagorno Karabakh Republic. 7. NKR Defense Army, NKR Police and NKR National Security Service are the only organizations in Nagorno Karabakh which are allowed to bear arms. 8. NKR Defense Army is a dynamically developing, combat-ready organization with high morale. 9. NKR Defense Army is a modern, well-equipped army  with effective command and control, border guard, air defense, heavy and light artillery, mechanized infantry, engineering, intelligence and special operations units. 10. NKR Defense Army officers are highly trained professionals, many of whom have extensive combat experience. The training and military education of current and future officers of NKR Defense Army is a continuing process. 11. NKR Defense Army is considered by international military experts as the most capable military force among all post-Soviet militaries on the unit-for-unit basis. 12. NKR Defense Army actively cooperates with international organizations, including the OSCE (ceasefire regime monitoring), the ICRC (law of war, human rights, landmine awareness, hostages), the HALO Trust (humanitarian de-mining) and the IWG (working group on refugees, internally displaced and hostages).